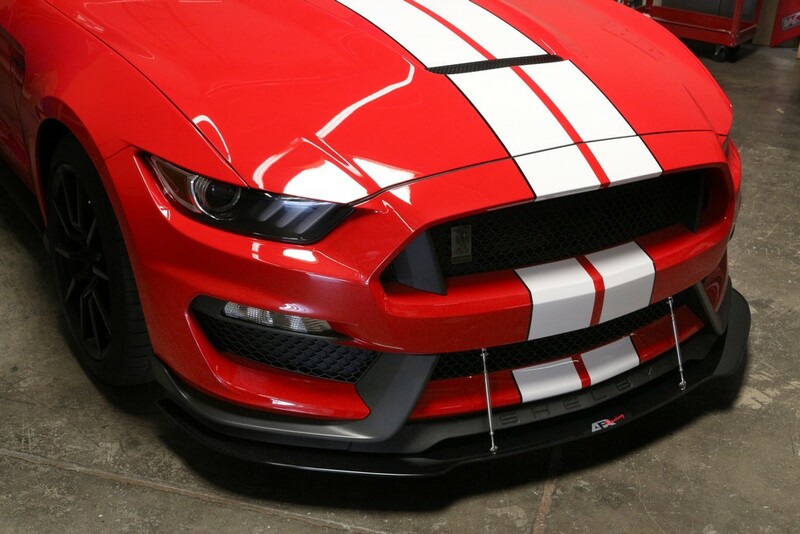 Discussion in 'GT350 and S550 Technical Forum' started by VoodooBoss, Feb 20, 2017. I noticed this splitter on @mattlqx car from photos of him at Chuckwalla this weekend. Looks great and a nice option from the OEM or CF R splitters available. Probably a LOT easier to install too. 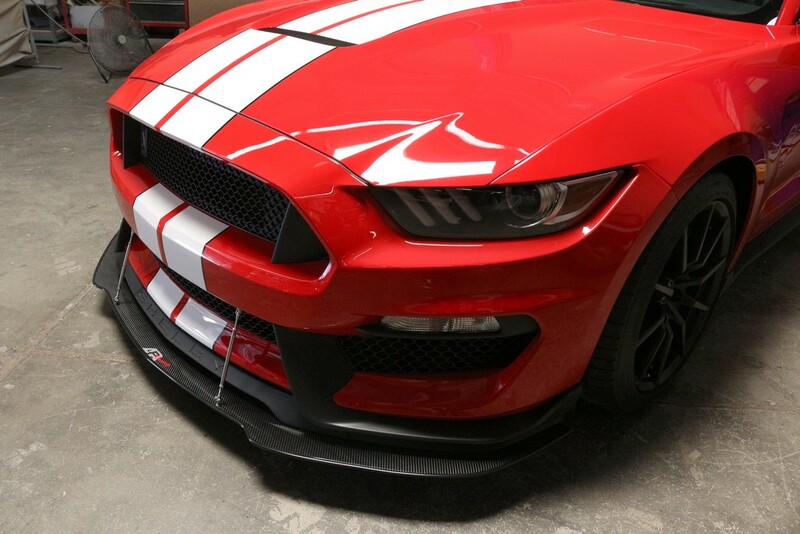 I noticed they also have canards for the 2015+ Mustangs but I don't think they fit the GT350. It is in no way easier to install. It isn't plug-and-play and more or less is a custom application. The entire nose has to come off to align properly and drill attachment points. It also needs cut appropriately around the air kick-ups for the wheels. And of course you have to pick where you want the struts to mount and drill those. I like the look and function, but the piece appears to be more resin/fiberglass than it is carbon fiber. If you get a deal on it, I'd say it's a good buy. I ordered in on New Year's day, the last day of their sale and got free shipping (usually $120) and 15% off. So it was $390 out the door. Here's one of the reasons why the Ford Performance lowering springs have no appeal to me. Just barely gets on the trailer now. 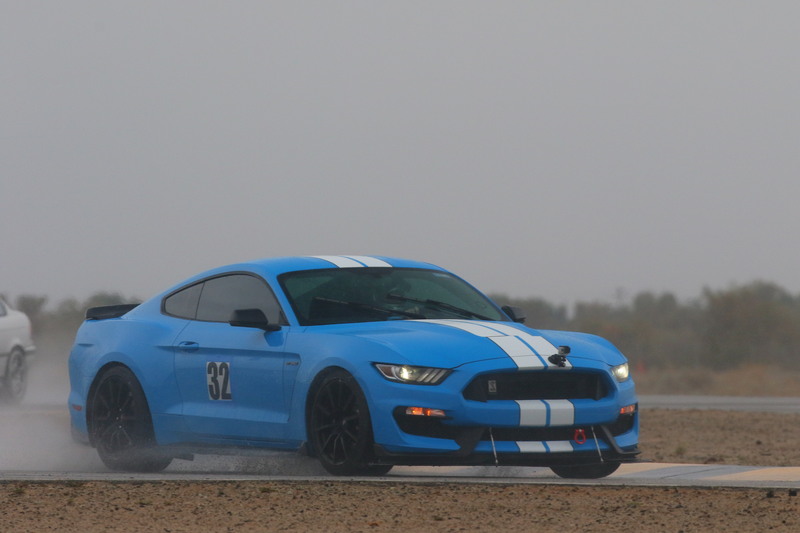 And here's an action shot from Chuckwalla on Saturday. The proof that it's working appears to be some flex in the middle. Nothing too crazy though. I think placing the struts a little further inward like the red car might've helped there. It is in no way easier to install. It isn't plug-and-play and more or less is a custom application. That's good to know. Did the kit come with all the mounting hardware? It comes with some mixed hardware. I forget what we specifically used out of it, but for the most part, we had to buy new because there wasn't enough or they weren't the right size. U-nuts, beefy washers and bolts primarily. The struts we used entirely what was provided (except for more washers). that looks like a bit of work. First post on this forum but a member on mustang6g... 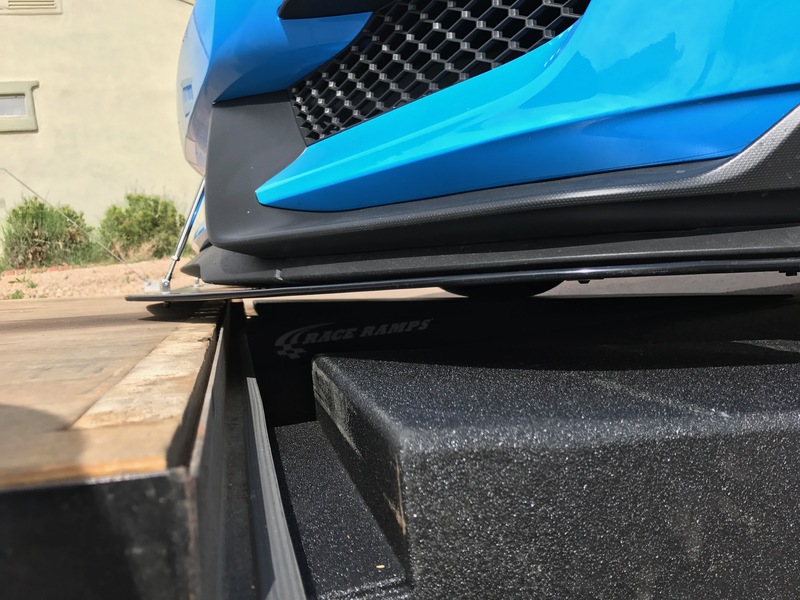 I just ordered this splitter and drag wing. Nice to see the install in a bit more details than what is provided on the website. I will take your advice and place the struts as displayed on the red car on the website! Welcome to TMO. Let us know how the splitter and wing install go. Do you have a 125 kart? Sure I will post pics once I get them. I will wait for the oil line recall to be done since I dont want the dealer to mess with the splitter. I dont think they will get into the trouble of removing the bumper to do the lines! I used to own a 125 cc kart back in the late 90's with a friend... Less expensive then a GT350 and almost if not more fun!! I always use this login name on forums when available. It all started with my Hotmail address! You mentioned that some cutting needs to be made... what did you use to cut the CF cleanly? I received the splitter yesterday. Looks nicely crafted. Not a lot of harware included so I will have to improvise and add more. I will follow the lead of what mattlqx did. I will wait for recall work to be done and install it after. 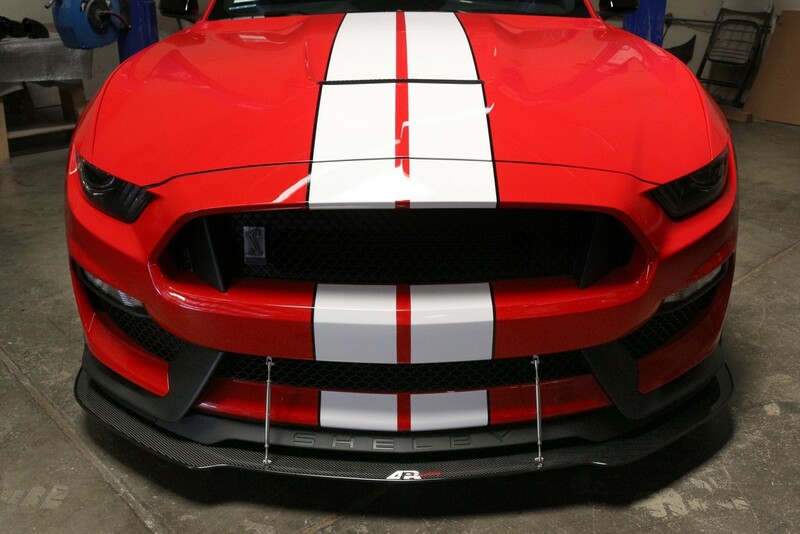 I'm also on the fence between the GT350R style wing and the APR GT250 wing... a bit extreme but I would take it out when not at the track... no ordered yet, still debating it in my "libra" head! I pulled the trigger on an APR GT-250 yesterday. I was waiting to update my build thread until I get more confirmation that's it's shipping though. Thanks for the tip on the Acorn Nuts. 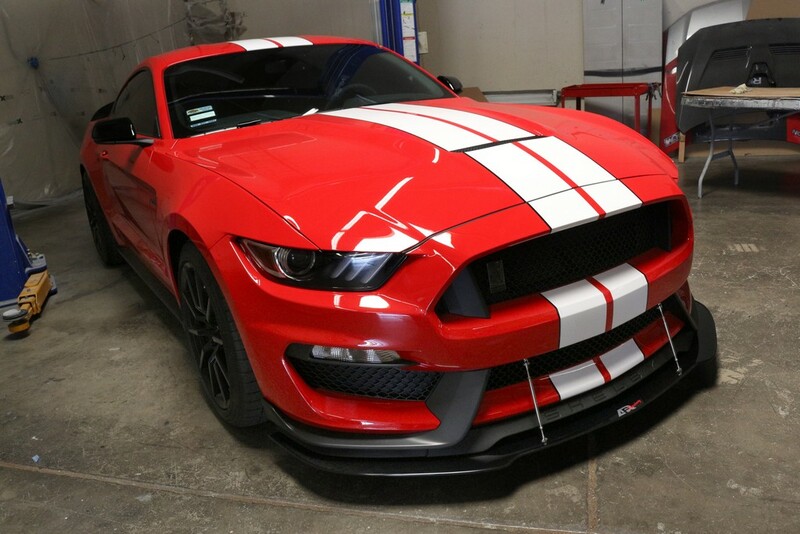 Glad you pulled the trigger on the Gt250 wing... it gives me the courage to go forward also. I'm waiting for a reply from the local canadian APR distributor to see if shipping fees could be lowered. Post pics once installed! I'll do the same! Are you planning to leave the wing on or go back to track spoiler when not at the track? Damn you matt! I just called and ordered the wing... I'll try to convince my wife that it's a family picnic table when we go out with Shelby!! 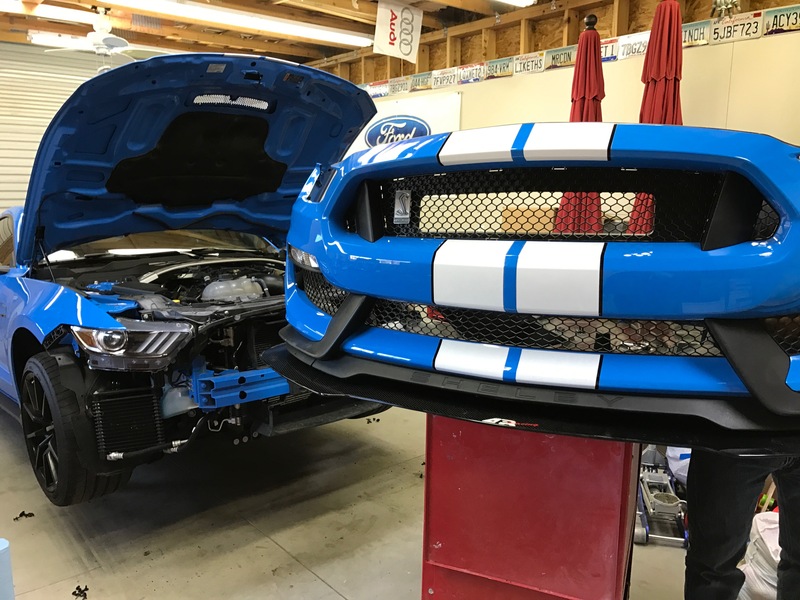 Your GB GT350 look great and nice thread on the splitter install. Quick question... I'm getting ready to tackle the install of the APR splitter (I have front GT350 tow hook coming next week so will do everything at once). I've read instructions on how to remove bumper... should be OK. I bought extra bolts/nuts/washers to affix the splitter... What I cant figure out is when the APR splitter is screw on how do you access the screw holes to put the bumper/splitter back on? Did you drill some matching holes in the APR splitter to access the factory holes? I like to plan ahead and prepare for the worst once I start the install! 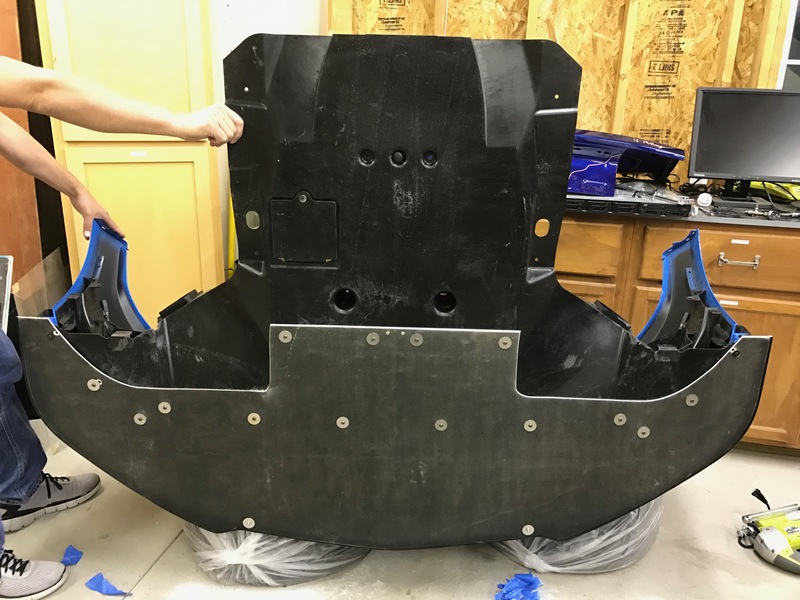 Their instructions are to basically affix the splitter and then remove the whole front bumper cover as a whole as needed. Which is totally ridiculous. We threw away that idea and instead got a bunch of U-nuts (these things) and applied them liberally to the belly pan. The splitter is mainly held on with these new points, but some existing screw holes are also used. You can see here in this picture all the holes we made to mount them. 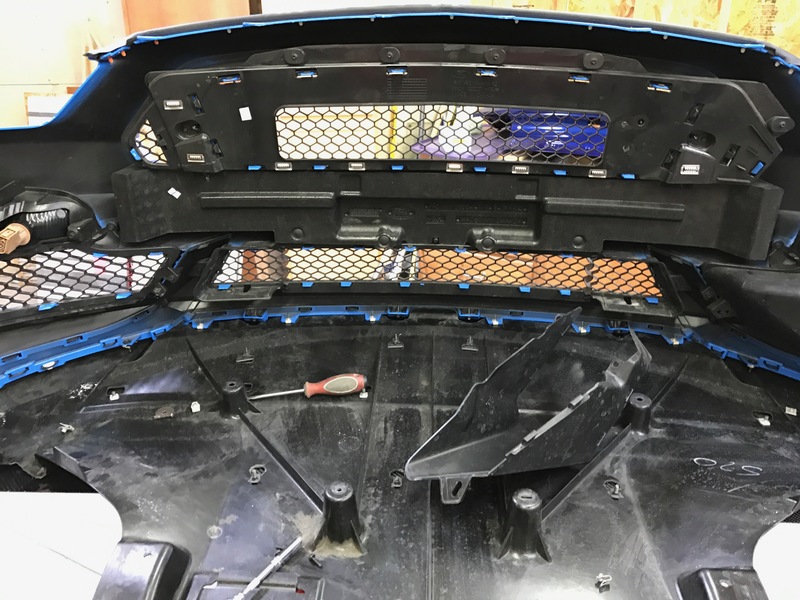 With that, the splitter is completely removable without removing the bumper, with the exception of the strut mounts since those are secured inside the bumper cover with the provided hardware. Thanks! good idea about the U-nuts. Now I understand why your splitter is removed on the pics you posted on your build thread. I'll try something similar. great to be able to remove it if necessary. Yeah, it's much easier to rub on things with it on. And I don't trust my wife driving with it on, lol. kart125 and VoodooBoss like this.